= Inu ni totte taisetsu na koto wa yoku asobi, yoku nete, yoku taberu koto desu. = The important things for dogs are to play well, to sleep well and to eat well. I am your guest teacher Silver Sensei. We are going to study how to use にとって ( = ni totte) today. = A is ~ for/to B. Some people seem to have a problem knowing which one to use. You see things from the stand point of B. = Silver Sensei ni totte nihongo wa muzukashiku nai. = Japanese is not hard for Silver Sensei. = Maggie wa watashi ni totte taisetsu na tomodachi desu. = Maggie is a precious friend for me. = Nihon wa watashi ni totte dai ni no kokyou da. = Japan is like a second hometown for me. = Ima, nani ga jibun ni totte juuyou na koto ka kangae nai to ikenai. = You have to think what is the most important thing for you. = Kyanpu wa kodomo tachi ni totte tanoshii natsu no omoide ni natta. = Camping became a fun memory of summer for children. = Kare wa watashi ni totte ani no you na sonzai desu. = He is like a big brother to me. = Futari ni totte kenka suru kotomo tama niwa hitsuyou da. = It is sometimes necessary for you two to fight with one another. = Asa shan wa kami ni totte ii ten to warui ten ga aru. = There are advantages and disadvantages to washing (or shampooing) your hair in the morning. I have my favorite toy and it is very important for me. = Kono omocha wa watashi ni totte takaramono desu. = This toy is a treasure for me. But I’m sure it is something worthless for other people. = Kono omocha wa hokano hito ni totte garakuta desu. = This toy is junk for other people. Now we can connect these two sentences showing the contrast. ＝ Kono omocha wa hoka no hito ni totte wa garakuta desu ga, watashi ni tote wa takara mono desu. = This toy is junk for other people, but it’s a treasure for me. 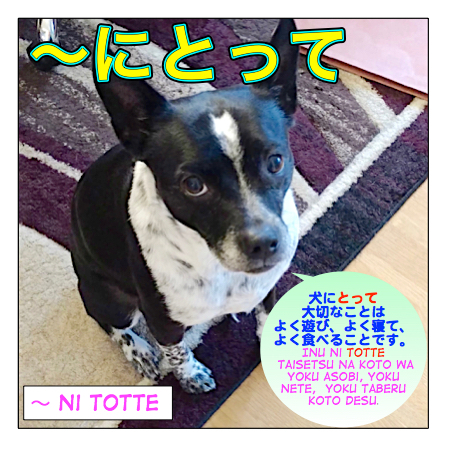 You use a particle は ( = wa) after にとって ( = ni totte) to show the contrast. = Anata ni totte wa doudemo ii koto kamo shirenaikedo, watashi ni wa shinkoku na mondai nano. = This could be nothing for you but it is something serious for me. = Nomikai no sankahi hassen en wa, gakusei ni totte wa takai. = 8,000 yen for the drinking party is expensive for students. Note: You can also say には ( = niwa) instead of にとっては ( = ni totte wa) in the example sentences above. にとっては ( = ni totte wa) stresses the meaning of “for someone” more. = Kare wo saiyou suru koto wa kaisha ni tottemo purasu ni naru to omou. = I believe hiring him will be a great advantage for the company as well. = Nihon no atsui natsu wa ningen (ni totte) dake dewa naku petto ni tottemo taihen na kisetsu da. = Hot summers in Japan are a tough season not only for people but also for pets. = Kono keitai no ryoukin puran wa kazoku ni tottemo toku rashii. = I heard this cellphone plan is beneficial for my family as well. Note: Again, you can also say にも ( = nimo) instead of にとっても ( = ni totte mo) in the example sentences above. にとっても ( = ni totte mo) stresses the meaning of “for someone” more. = Precious experience(s) for me. = A hard time for her. = Natsuyasumi ni kazoku de Hawai ni iku no wa kodomo ni totte no yume datta. = For our child, getting to go to Hawaii this summer with the whole family was a dream. = Thank you, Silver Sensei! = Minna ni totte kono saito ga tanoshin de nihongo no benkyou ga dekiru basho ni nareba iinatte omoimasu. = I hope this site becomes a good place for everyone to have fun learning Japanese. im new to the website. Please don’t stop posting continue! i find it very helpful! Thank you for the lesson, it was very enlightening. But I have a question. I am REALLY interested in your answer. Is にとって similar to にしたら? You use にしては when you have certain idea of what comes before. = konoko wa gosai ni shite wa ookii. = This child is big for five years old. The speaker has certain idea how big five-year-old children. X この子は、５歳にとって大きい　doesn’t make any sense. Topics (A) is ~ for (B). = Kono geemu wa kodomo ni totte wa muzukashii. = This game is difficult for children. You are talking about how difficult the game is for children. I have a lesson on にしては. Do you want to check it? Thank you Maggie Sensei for the quick reply! Really appreciate it. Didn’t realise that you have a lesson on にしては. Will check it out. I still can’t really understand if にとってcan be used here or not. Oh sorry. I misread your question. In this sentence: 日本の暑い夏は人間だけではなくペットにとっても大変な季節だ why do you use ではなく and not ではない? What is the difference? I think you meant to say her. Q；why do you use ではなく and not ではない? What is the difference? I am sorry. I don’t quite get your question. 人間だけではない instead of 人間だけではなく？ I used なく to connect the sentence.